Derry is a town, a town with a sinister feeling. Nobody quite knows why people want to escape Derry but when Stuttering Bill, Ben Hanscom and co are forced to reunite back in their home town terror reigns. ‘It’ has come back and the group must put aside the fear to bring the fight back to ‘It’. But what is ‘It’? Pennywise the clown has been on a terrifying spree over decades – now something lurks, waiting. 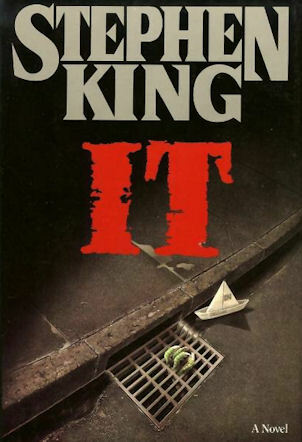 King delivers an iconic piece of storytelling, walking the tight-rope of complex plotting and beautifully defined characters with ease where many authors have failed. King proves in this novel that he is the master of creating an intricate world where our beloved characters reside – allowing us the privilege of understanding each character as if he were our true life friend. The fact that he is able to bring to life so many characters is outstanding. It is all too easy for an author to have a few ‘main’ characters whilst neglecting the internal and external world in which those very characters exist. When comparing It to less accomplished piece of work it is clear that It is truly in a class of it’s own. We flick between different points of view, inside the heads of the good guys, the bad guys and the unfortunates in between. This could (and does) confuse some readers but King demonstrates an ability to pull of these intricacies with such style and poise that they add to – rather than distract from – the story at hand. The jumps between time periods can be equally as tricky and is generally a more divisive aspect of this novel. I was taken by the warmth of King’s good guys. The innocence of childhood is on full display here – the encounters with adults who avoid seeing the obvious, the bullies that torment us and the power of a group so loving toward one another. There were themes of love, loyalty and a quest for redemption that are powerful; fuelling my desire to see the children succeed in the face of adversity, to seek closure to an altogether terrifying ordeal 27 years ago. I adored the internal conflicts of the group of youngsters. Eddie’s hypochondriacal vulnerabilities produced a feeling of wanting to ‘look after’ him as though he were my younger brother. Bill’s unwavering loyalty to the cause coupled by the strong sense of confidence that he provokes in his peers was beautifully portrayed whilst subtly accentuating his own disbelief at what may loom ahead. Mike was the perfect fit to the band of ‘Losers’, lending backstory by way of his father’s altercations with his own bully’s father and information from generations past. Stan was an odd one; I was never really sure about what made him ‘tick’ but that added perfectly to the group dynamic. Beverly’s evolution from willing victim to her father to a head strong yet emotionally vulnerable woman was once again subtly portrayed. The beauty of the story for me was the bond that had not been eradicated in the many years past. Each member of the Losers found themselves feeling ‘the love’ as though 27 years hadn’t past. As someone who lost a friend and later found them several years later this was representative of what I longed for but never quite fulfilled. The length of the novel is my ONLY grip about this work. I would venture a guess that about a quarter to a third of the novel could have been ‘chopped’ in the editing room as the detail – though wonderful in places – left me dying for the chapter to finish to move the story forward. How this would have affected the quality could be debated all day but for me it was the length that was daunting and at times tiresome. Final Thought: One of the best all round novels I have read. King truly crafts a compelling, emotionally charged epic that builds to a dramatic climax. A true classic in horror/suspense.